Our mom was diagnosed with Sjögren's in January of 2014. Previously, she had been battling the symptoms of Sjögren's for over 8 years. For as long as we can remember our mom has had headaches, dry eyes, fatigue, arthritis, and many other symptoms. Just before she was diagnosed, she was hospitalized after the whole left side of her body went numb. If she had been diagnosed earlier, then she might not have developed the numbness that she still has, and probably will have for the rest of her life. Sjögren's is a generally unheard of disease. It is a chronic autoimmune disease in which someone's white blood cells attack their exocrine (moisture producing) glands. It is the second most prevalent autoimmune rheumatic disease and is three times more common than better known diseases such as Lupus and Multiple Sclerosis. It affects up to 4 million people in America, and 9 out 10 are women. Sjögren's even effects more women in the U.S. than breast cancer. The average time it takes to diagnose Sjögren's is just under 5 years. 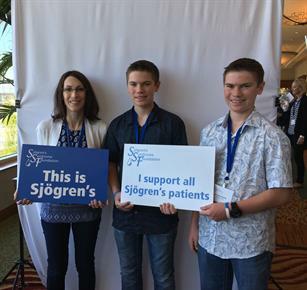 The Sjögren's Syndrome Foundation (SSF) has set a goal "to shorten the time to diagnose Sjögren's by 50% in 5 years." If our mom was diagnosed in 2.5 years after her symptoms became prominent, it would have made a huge difference. Our goal is to make Sjögren's a household name, and to get it onto doctor's differential diagnosis lists to decrease the time it takes to achieve a diagnosis.